Looking for a quick way of building trust and credibility with your future clients and employers? 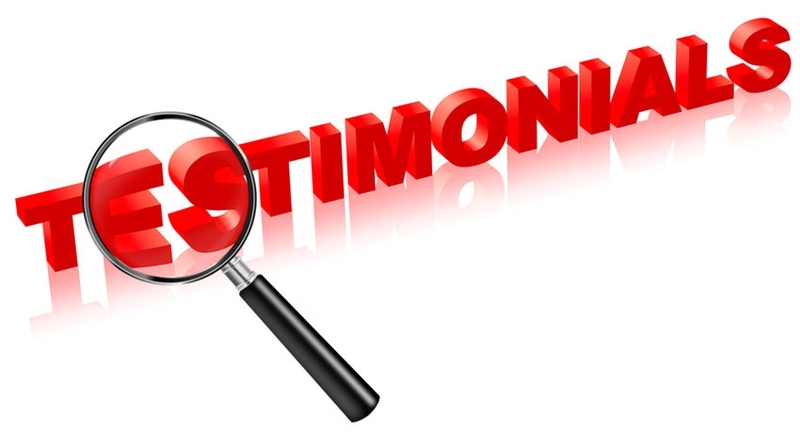 Ask your existing clients and employers for a testimonial! It is a great tool to help you achieve that. But do you guarantee the testimonial you are receiving is going to be effective to get you more business, if at all? Get to know what exactly makes a great testimonial great, then you would be helping your clients to help you. Another reason for a testimonial is to show sort of physical proof that the people you work with have completed a job well done, a form of appreciation for their contribution. Sending a testimonial to your suppliers as would ensure a continuing good relationship. Who knows, you may increase the chances you have to continue the first mutual class treatment for both parties. Maybe they will even go the extra mile, just for you, because of the connection beyond simple business. Learn how to write a testimonial and what makes a great one in the following article. You want to write down what is fitting and considerate for the testimonial. Write the testimonial in the mind that testimonial will be shown to others, not just for the recipient's personal viewing. Engagement is important, it’s what keeps them reading and the testimonial memorable. Providing real examples would make it more related and really helps here. Discuss the service, product and the people who assist you. Has an amazing experience? Then say so! But don’t be overly emotional. Remember you still need to keep it clear and concise. You want to have the testimonial to look as authentic as possible. The easiest way to provide it is by writing the way for people to contact you. This allows them to verify that you are indeed the one that give the testimonial and that the testimonial is genuine. Don’t fake about using it, just for the sake of helping out a friend. It’s the credibility and trust you are risking. Some readers do get suspicious with some dodgy sounding testimonials, which might damage the company holding the testimonial and your reputation. You aren’t writing an essay, but more of a report of commendation. So if you give a really long piece, people are less likely to read it or share it around. If you are providing one for a website, then consider working together with the owner that you have more to say. Then write about the reasons why you would choose the certain product, arrange a hypothetical case-study or as what the owner would agree to. Start with the problem you are facing, how the service or product you employed overcome this problem. Follow it by how you like the customer support you received and the product’s performance. It might seem that your view of the product or service might be skewed to their favor, it's better to do so if you aren’t all that great with words. If you could work closely with the business, they would receive a direct feedback from your experience. They should know the general expectations of the experiences, the intended use of the testimonial and know what they would emphasise after all. If you have a good experience, then they have the incentive to write it for you. Happy to prove a reference? Then go ahead and let the recipient know. If anything it will be useful to add an extra credibility to their testimonial. Not many people will be bothered to call the name on the testimonials, but having the contact details available itself will give more confidence. While you can complain about the bad experience you had, it’s better to provide it straight as a feedback. Testimonials are meant to describe the good experiences. Don’t expect the testimonial to be published if it is negative. Testimonials works best in “real” language. Something more colloquial will make the testimonial feels more authentic and helps readers to connect. Heard that other customers have some worries with the product? Then try to prove that those worries are groundless and they would be likely to get the experience the product or service for themselves. Testimonials should be appropriately following the point that you are making and reflect your experience. The format will be similar to that of a professional business letter, which includes a header with contact information and the address of the recipient's contact details. An opening salutation should greet the recipient formally (e.g. Dear Mrs. Janie). The most valuable part of the testimonial for employees is not the content. Rather, it is the fact that it professionally comes from you. It should be considered as an official document and sloppy looking appearance could damage the effect of the of the professionalism. Write an opening sentence, stating the name of the recipient, position and period of employment to date. Include his salary if appropriate. The middle paragraph should expand on the recipient important duties and level of performances. Any special recognition should be included. The purpose of the testimonial should be under consideration. Is the recipient applying for the higher-level position? Then perhaps you would highlight all of his impressive responsibilities and experience with leadership. Is he changing his career? Then emphasize his transferrable skills. The closing sentence could be reserved for your personal feelings for the recipient. How positive are you in regards with the employees? Why do you personally recommend him for the position of his interest? If you could, mention that you are open to further contact for information on the employee.